Back to the ice cream section for me! I decided to do another supermarket walk through, this time for Cub Foods, the next closest to my house. As expected there wasn’t really anything till I got to the frozen treats, and then I found these and one other type (post coming soon). 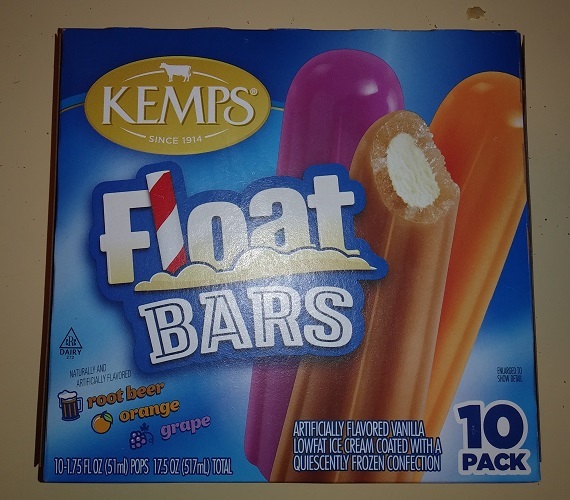 These float bars are basically a popsicle shell covering vanilla ice cream, getting the whole soda float vibe. Of course root beer is the flagship flavor, but there’s also orange and grape. Now I’ve never heard of a grape float but I guess that’s a thing, maybe? I don’t really care though, I just needed the root beer. I don’t know if they sell this at all in non-variety packs. All that was in my local Cub was this. The root beer popsicle part has a very generic and very weak flavor. You can barely make out that it’s root beer. The vanilla ice cream is nice and sweet, but completely overpowers the weaker root beer shell, so it is hardly a root beer float flavor that you get. Yeah, um, no. I don’t like this at all. The root beer is weaker than those root beer pops, and those were pretty mild. These just fall flat. I don’t recommend them at all. If you want a root beer float bar, look somewhere else.